This project focused on the restoration and interpretation of a well (with stone steps and drinking ladle) located adjacent to the road around Applecross bay. It has been known as the ‘Spout Well’ or in Gaelic ‘Stroupan a bhile’. Folklore and oral history identify it as a Holy Well associated with the times of St Maelrubha and his monastic settlement founded in AD 673. 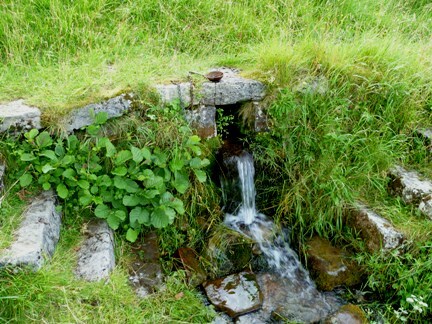 The history of the Holy Well is not well documented but it is known that when the road around Applecross bay was constructed some two hundred years ago, the stream which emerged from the hillside some twenty metres to the east was led under the road in a very well-constructed dry stone culvert. Here the fresh spring water escaped over a stone slab and out into the open. Stone steps were constructed on either side of the spring to make it accessible for local people to 'take the water'. The Holy Well has and been repaired and is now accessible for visitors via a spur path. The site is now marked by an engraved stone. One can learn more about the Holy Well in the Applecross Heritage Centre.